Editor,—The report of Byler’s syndrome with raised sweat electrolytes in an Irish traveller kindred1interests us, as we have observed raised sweat electrolytes in two members of the original Byler kindred who have Byler’s disease. Neither has cystic fibrosis; both underwent liver transplantation in their second decade and subsequently developed pancreatic disease. One has had recurrent pancreatitis and the other has a fibrotic pancreas with exocrine insufficiency.2 In the children without Byler’s disease whom we attend, pancreatic disease after liver transplantation is not usual. Have affected traveller children, particularly older ones, had pancreatitis? We can provide additional information on the sister and brother with progressive familial intrahepatic cholestasis and raised sweat electrolytes referred to by Bourke et al 1 and described by Lloyd-Still3 4 (fig 1). Neither parent was of Irish or Amish background; the father (II.2) came of Norwegian and the mother (II.3) of Italian stock. At age 3.5 years, the boy (III.5) had normal serum γ-glutamyltranspeptidase activity (29 U/ml; expected, <40) and moderately raised cholesterol concentrations (8.0 mmol/l; expected 3.9–6.5; determination at age 1 year,41.6) with marked hyperbilirubinaemia (458 μmol/l; expected, 1.7–20.5). Fasting serum bile acid concentrations were not measured but at age 1 year had been ‘markedly elevated’4; intense pruritus was present. Serum amylase and lipase activities were normal. The (III.2) girl came to liver transplantation aged 8 years and the boy 4.5 years. Both died of infection within two months of surgery. On light microscopy, findings in the native livers resembled those in the older traveller children1 and in the two Amish children who underwent hepatectomy.5 Coarsely granular bile like that seen in Byler’s disease (‘Byler bile’)5 was found on transmission electron microscopy (fig 2). 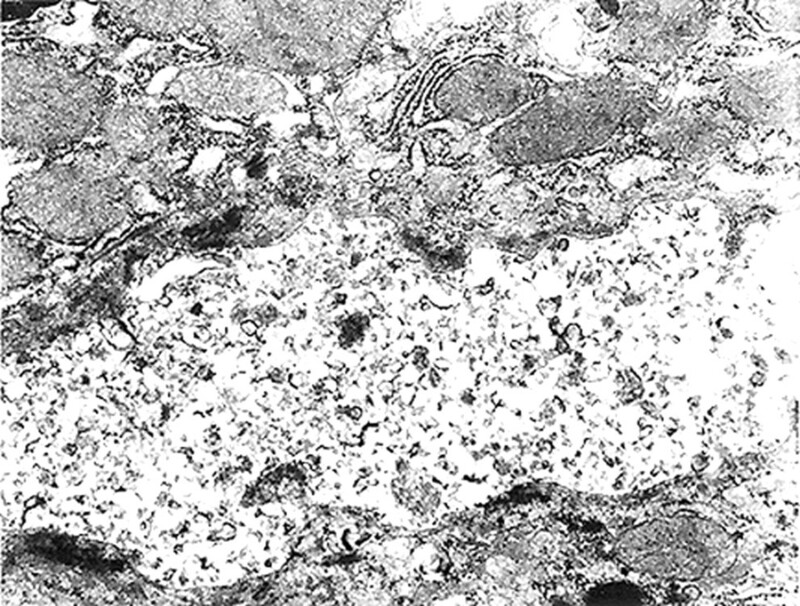 Transmission electron micrograph of coarsely granular bile, characteristic of bile from children with Byler’s disease,5 within canaliculus of liver obtained at hepatectomy in affected boy (III.3); 4% paraformaldehyde/0.5% glutaraldehyde in Swenson’s phosphate buffer, pH 7.3; OsO4/uranyl acetate/lead citrate (original magnification × 18 000). Convergence of phenotypes leads us to believe that these children may have had a lesion at 18q21-q22, the Byler’s disease locus,6 to which the disorder in the traveller kindred also has been mapped.7 We would like to know what was seen if liver tissue from an affected traveller child was examined by transmission electron microscopy. We thank Dr Agostini and colleagues for their interest in our paper describing an Irish kindred with Byler syndrome.1-1 As yet, we have not examined liver tissue from the traveller kindred using transmission electron microscopy. As these children likely will need further evaluation and/or transplantation in the coming years we will have the opportunity to undertake further studies including analysis of biliary bile acid content and examination of biopsy samples for the presence of ‘Byler bile’. We are aware of the report of Knisely et al describing pancreatic disease in members of the original Amish kindred with Byler’s disease.1-2 Although we have not observed pancreatitis or evidence of pancreatic dysfunction in the Irish traveller family with Byler’s syndrome, one of us (BB) has encountered a child with progressive familial intrahepatic cholestasis and chronic pancreatitis at another institution (patient of E Roberts and R Superina, Hospital For Sick Children, Toronto). Whether this child has a mutation at 18q21-q22 is currently being evaluated. The presence of raised sweat electrolytes and pancreatitis in a subset of these children with Byler’s disease/syndrome is certainly intriguing and raises interesting questions about the function of the mutated allele at 18q21-22. Ongoing genetic studies of members of the original kindred and unrelated families such as this Irish family should soon provide answers to these questions. (1996) Byler-like familial cholestasis in an extended kindred. Arch Dis Child 75:223–227. (1995) Pancreatic dysfunction in Byler disease. J Pediatr Gastroenterol Nutr 21:328, (abstr)..
(1980) Familial cholestatic syndrome with elevated sweat electrolytes. in Proceedings of the 8th International Congress on Cystic Fibrosis. ed Sturgess JM (Imperial Press, Toronto), p 25a, (abstr)..
(1981) Familial cholestasis with elevated sweat electrolyte concentrations. J Pediatr 99:580–583. (1997) Genetic and morphologic findings in progressive familial intrahepatic cholestasis (Byler disease and Byler syndrome): evidence for heterogeneity. Hepatology 26:155–164. (1995) Mapping of a locus for progressive familial intrahepatic cholestasis (Byler disease) to 18q21-q22, the benign recurrent intrahepatic cholestasis region. Hum Mol Genet 4:1049–1053. (1996) Familial progressive intrahepatic cholestasis (Byler disease): evidence that the disease haplotype in the Old Order Amish is also found in the Irish ‘traveller’ population. Am J Hum Genet 59:A248, (abstr)..